I want to thank Behr for sponsoring this post. I was provided with compensation for products used and my time to share this project. All content is original and honest, pinky promise! Growing up, my family didn’t celebrate Halloween much. I remember trick-or-treating maybe a handful of times and we attended a few carnivals and Halloween parties. But, my mom doesn’t like Halloween. And I get that. Well, I kinda get that. The gore and guts, no thanks. No thanks at all. I like the cutesy, fun part of Halloween. 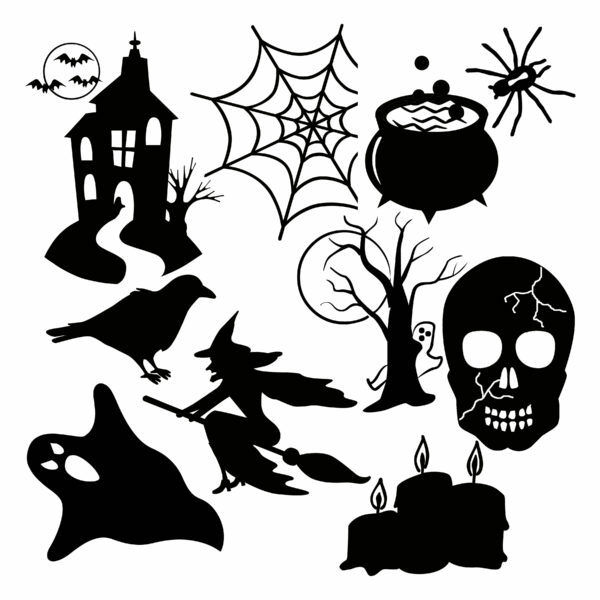 And decorating with the cutesy, fun side of Halloween makes me happy. It’s the kick off to the holiday season! 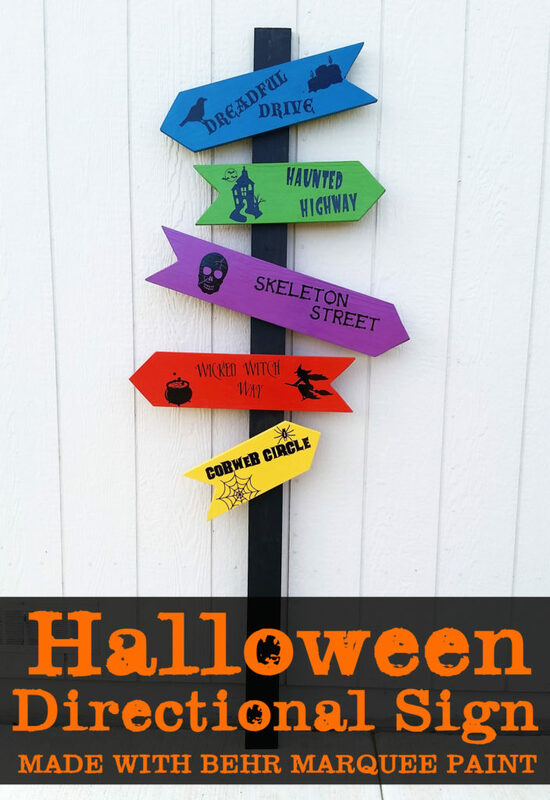 So I put together a fun Halloween project that turned out fabulously, thanks to BEHR® MARQUEE® Interior Paint & Primer! – Use the square box or other square to create arrows on the board. Line up the point of your box in the middle of the board. Mark the point of the box to create the point of the arrow. – Decide how long you want your arrows to be. I made mine all different lengths: 12 inches, 16 inches, 18 inches, 20 inches, and 24 inches. There was a little left over at the end of my board. 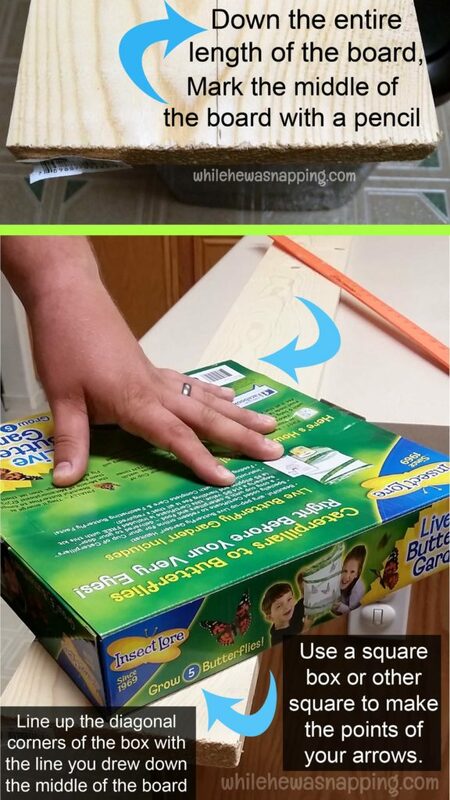 Measure and mark all your arrows with the box and the pencil. 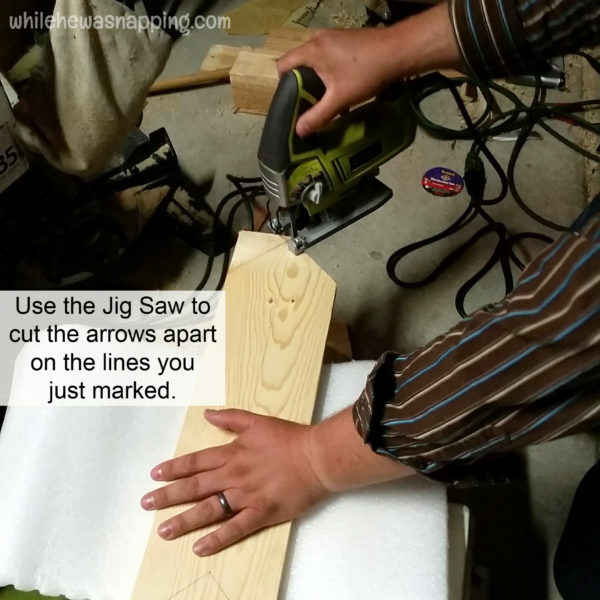 – Use the jig saw to cut the boards apart. I let Mr. Napping do this part for me, as I hadn’t ever used the jig saw before and we were on a time limit; he was leaving on a work trip. I didn’t want to end up missing fingers because of a lack of experience and familiarity. Be sure to brace the board while you cut. – After you have all your arrows cut out, sand the wood until it’s smooth. We used a belt sander for the majority of the sanding and then I did some touch up with sandpaper before I put on a coat of paint. 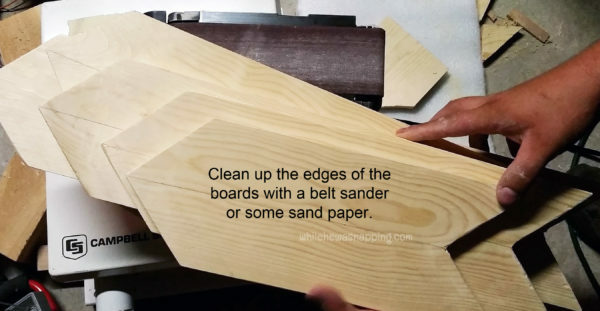 Don’t skip the sanding, your paint will turn out so much better if you take the time to prep your boards. – Paint each board one of the five colors of the MARQUEE colors. That’s right, no primer! The MARQUEE collection of paint has a One-Coat coverage guarantee over previously coated surfaces when tinted to any of the 372 colors in the MARQUEE Interior One-Coat Color Collection and applied to previously painted surfaces. I was very impressed with the coverage even though the boards were not previously coated. And not having to wait for a primer to dry was fabulous. My least favorite part about painting projects is all the waiting time between coats of paint. The MARQUEE paint covered my project well and dried fast, which made me a happy momma because it meant I didn’t have a paint project on my kitchen counter for a week before it was completed. 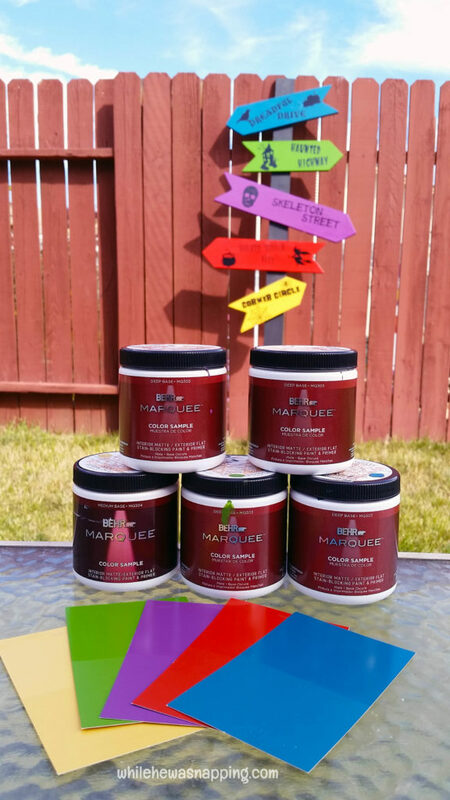 There is also exterior paint available in the MARQUEE line which has some great weather-resistant properties. If you’re new to painting, Behr has some great directions on how to correctly choose supplies, prepare and prime before you paint. – Let the paint dry for a minimum of two hours. Sand lightly with fine grit sand paper. 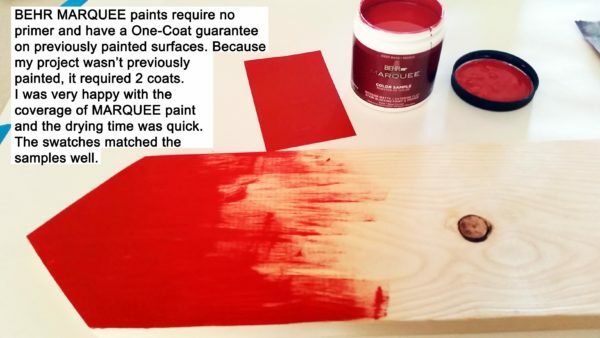 This mostly just removes any weird brush strokes or paint puddles that may have gathered and dried during that first coat so your next coat doesn’t just add to the weirdness. 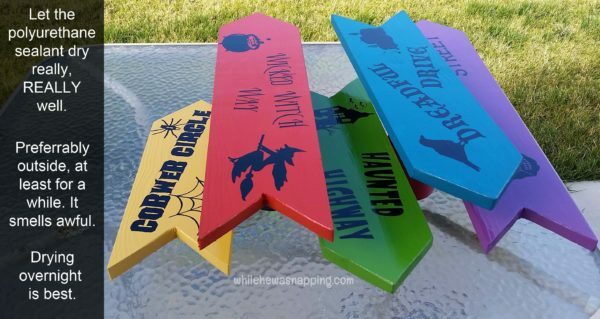 – Paint another coat of paint on each board. Let dry a minimum of two hours. 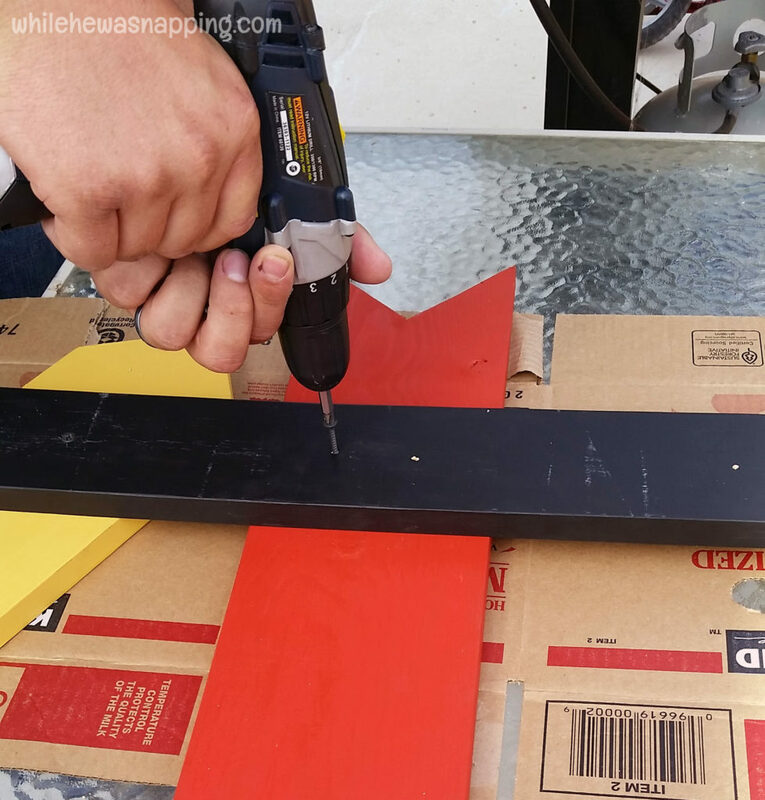 – Paint the 6-foot pine board with the black paint. Let dry and set aside for now. 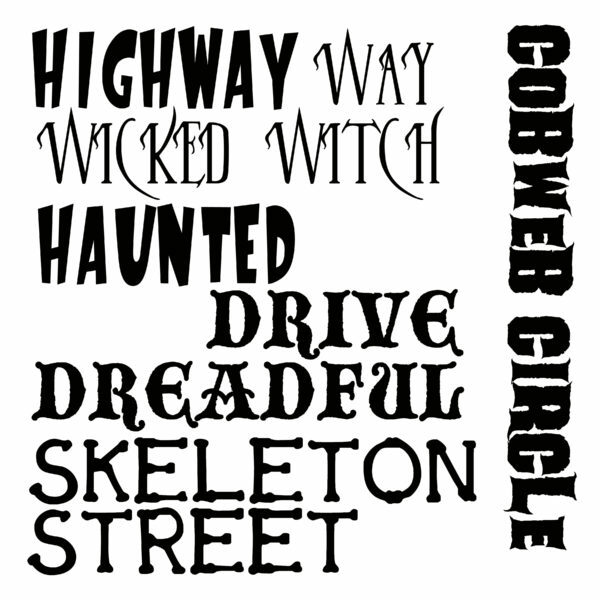 – Cut out of black vinyl any text and graphics you want to use on your signs with a craft cutter or a craft knife. I used my craft cutter for my signs. You can find the links to the jpg files I used to cut from here: TEXT and GRAPHICS. The files are formatted to 12×12 inches, as that is what fit my cutter. You can alter the images as you need to fit the dimensions you have available. – Weed out all the negative space from your vinyl and discard it. I prefer to use masking tape to transfer vinyl, rather than transfer tape. To do so, place a layer of tape over the image either from top to bottom or bottom to top until it’s covered with tape. I find it easier to get the vinyl to stick when I’m only pulling off a small layer of tape at a time – and masking tape is usually less sticky than transfer tape, so there’s never any gooey residue left behind. Use whatever you prefer to transfer vinyl for this part. – Place the vinyl on the board you choose and begin removing the masking tape a layer at a time. If the vinyl pulls back up, replace the tape and rub firmly with a blunt object (the handle of a butter knife or scissor handles work well). Then, pull the tape up again. It works best if you pull the tape back at a 180-degree angle. – When the tape is removed from the vinyl, rub the vinyl down firmly with the blunt object. – Repeat the vinyl transfer process with each board. 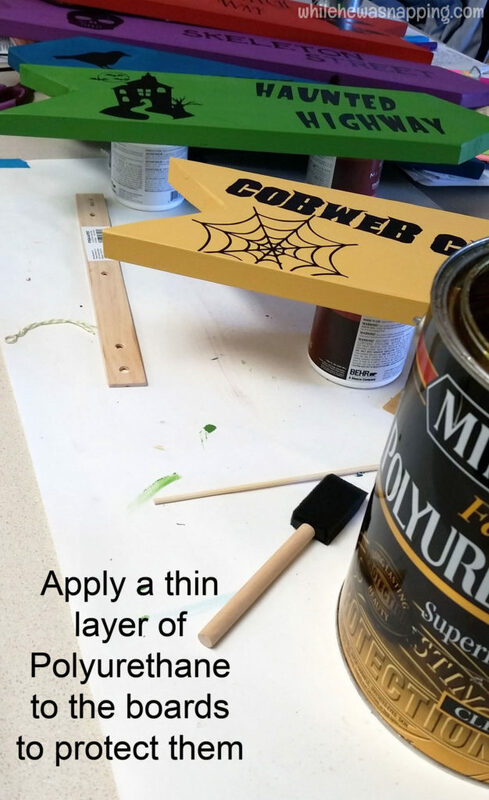 – Apply a thin layer of Polyurethane to each board. I intend to use this sign indoors and only applied a single coat to the face of the board. I didn’t seal the edges or the back. Let dry thoroughly, overnight if possible. Polyurethane can be a great sealant and protector once it’s dry, but it can bubble if it gets too hot, is applied too quickly or if items are placed on it before it completely dries. So, let it dry really well. – On the BACK of the black board , lay out the arrows and arrange them however you like. Mark the placement with your pencil. 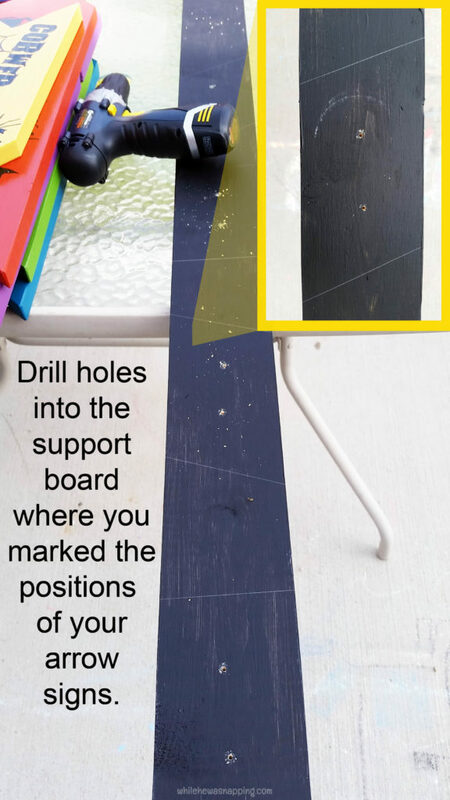 – Turn the black board over and drill pilot holes with the drill bit. You can drill all the way through the black board. I decided to do two screws in each board so that the boards won’t twist or spin. 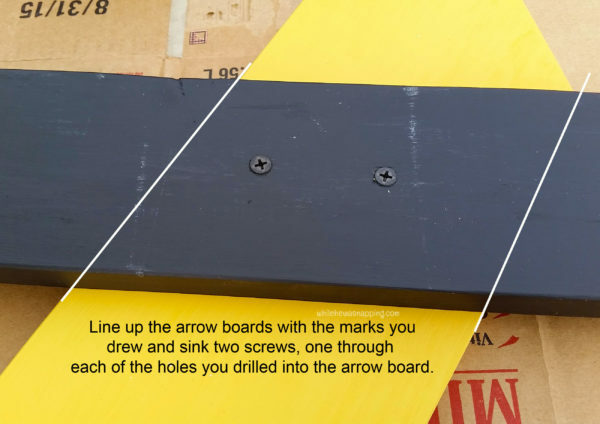 – Once you have the pilot holes drilled, you can position the boards underneath the black board and sink the screws through the black board into the arrow boards. By working from the back of the sign, your screws will be hidden. 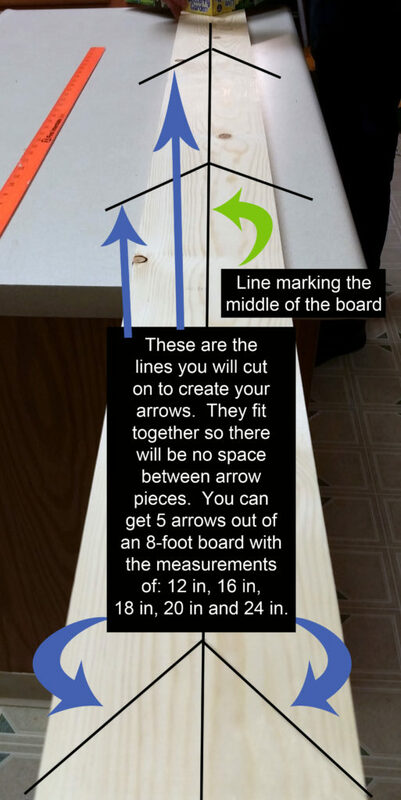 The boards are also thick enough you won’t need to worry about the screws poking through the front of the arrows. – This sign will be used at a Halloween party and I’m simply going to set the sign up against a wall in an infrequently trafficked area. It’s large enough to see, but hopefully it won’t get played with too much. Because all I really need to complete my day would be my three boys running around with pointy sticks screwed to a really long stick. It’s like the ultimate sword. Call the Emergency Room and alert them now. 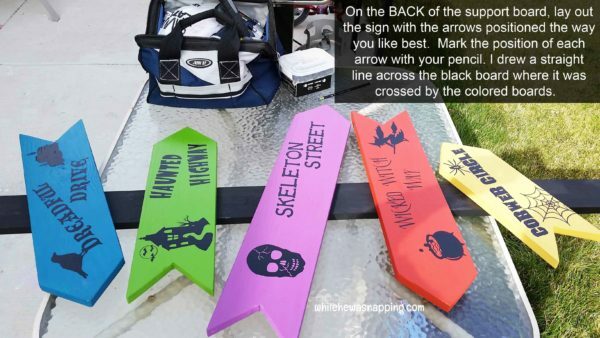 My younger sister has also asked to borrow the ultimate sword, I mean sign, for decor for a Halloween party she is co-chairing for the all the college kids at church. So, there you have it. 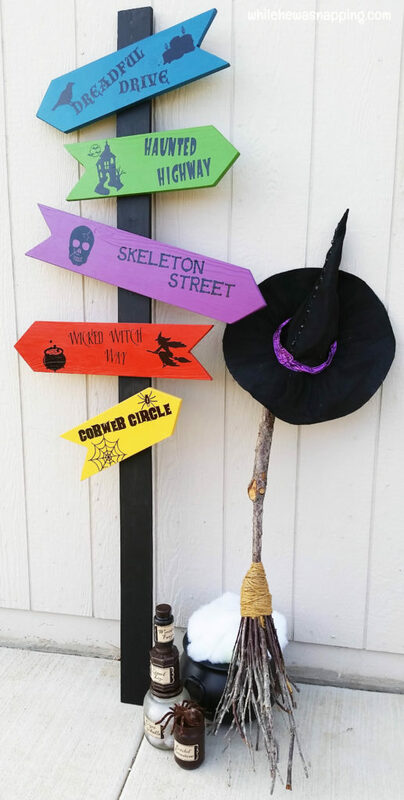 A fun and cutesy Halloween sign. No guts or gore here. Skeleton Street is about as close as I’ll get to that. 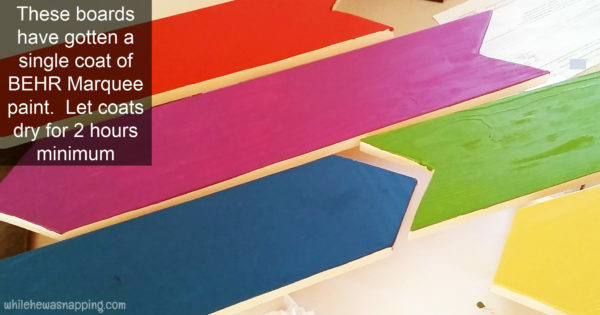 This seems like a lot of steps, but it’s actually a really easy paint project. Definitely something you could do in a day or two, tops. What are you dying to do with BEHR paints? This post is brought to you by BEHR. Color that’s True to Hue. If you feel it, you can find it. Visit True to Hue. 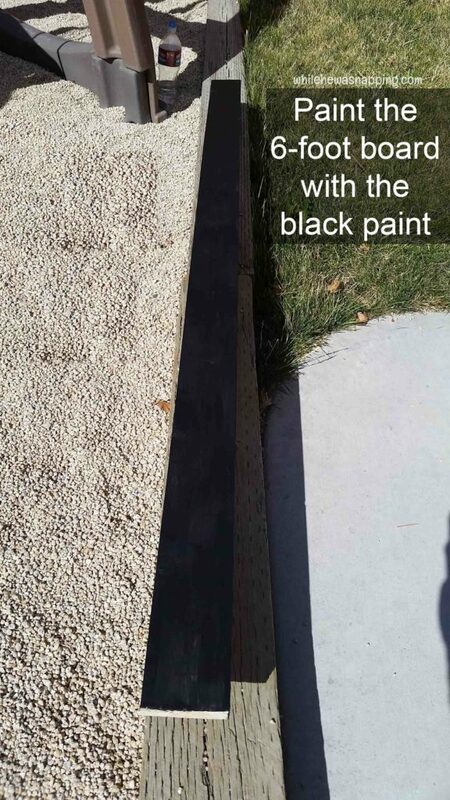 Behr sponsored this blog post. The opinions, photos and text are all mine, honest.